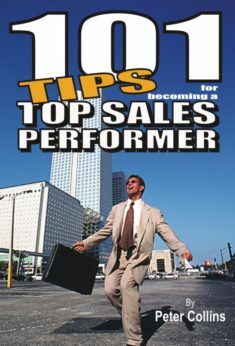 This is the second in a special series of books for the upcoming professional salesperson wanting to take their selling to the next level and grow as a superseller salesperson. Over the years very few books have been written that reveal so much as these six do. 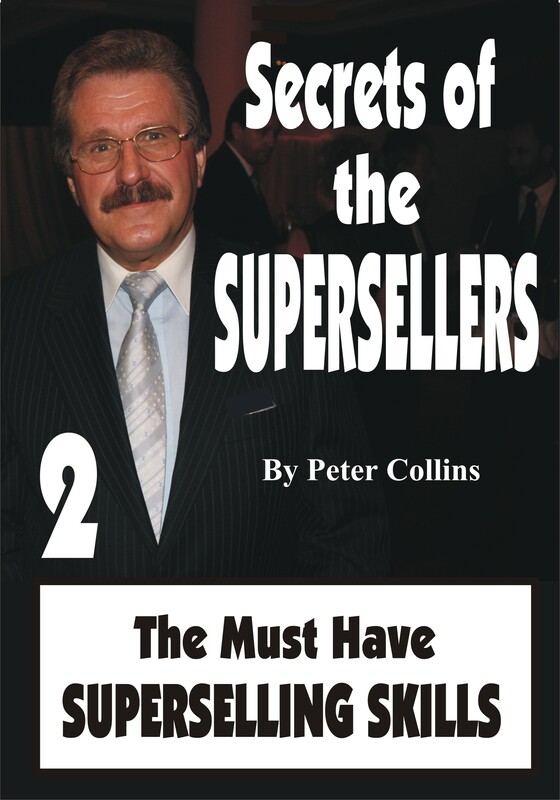 As a glimpse into the content of this book – Secrets of the Superseller – Book 2/6 – The Must Have Superselling Skills, now read on . . . In my early seminar days I worked hard at giving the participants what they wanted, but quickly found that the more I gave them what I was sure they wanted, the more they wanted – especially in any of the keynote talks I gave. One after another the attendees came up to me telling me what I delivered was good, but somehow lacking in “real” substance. If that is confusing to you, just imagine how confused I felt trying to deliver subject matter that always seemed to fall short of what it was they really wanted. Unfortunately, I kept wanting to please everyone; rewrote the content over and over; repackaged the material with more and more depth, but still the attendees wanted more. Then “out of the blue,” a mentor of mine suggested he would have a closer look at what I was doing, and within minutes of his evaluation I realised what I was doing that was less than favourable. I was pandering to salespeople who were not looking to improve, or to go back to basics on a regular basis, because they simply wanted someone, anyone, to give them an easier way to sell. Today, I find that I have little need to be as diplomatic as I have been so many times over the past 30 years. And Now that I have a little more experience, and the necessary “runs of the board” I feel I can tell it the way I should, and that’s all that really matters . . . it’s a little lesser used concept called the truth. As you read into this book, even more will be revealed to you . . . This is the second in a special series of books for the upcoming professional salesperson wanting to take their selling to the next level and grow as a superseller salesperson. Over the years very few books have been written that reveal so much as these six do. As a glimpse into the content of this book – read on . . . The dictionary describes PROFESSIONALISM as: “Engaged in, connected with, or worthy of the standards of a profession.” If you think you’re safe because your “Engaged in”, or “Connected to”, lets look at the second part which states “Or worthy of the standards of a profession.” The dictionary goes on to describe PROFESSION as: “An occupation requiring advanced education”. And without the appropriate education, you won’t understand the basics and therefore have trouble learning the more advanced concepts. The problem with sales in the 80’s and 90’s is we were turning out SALES-WISE REPRESENTATIVES. The ones Industrial Psychologists call “Comfort Zone Sellers”. People who are always going after new and innovative selling techniques before they’ve mastered the true and tried methods that have always worked. Now we’re in the 21st century, those past years have now begun to haunt us, because in so many ways standards have dropped. Not because those levels cannot be taught, far from it, it’s because so many of the supersellers in sales are no longer prepared to pass on vital information. So many have tried time and time again, only to be ridiculed because of what they’ve said, or to have a non-performing salesperson publically taking them to task because they “disagree” with the one with the runs on the board. So many salespeople today want instant fixes, in place of sound training. They experiment, rather than apply that which is know to give results. Their language contains phrases such as “Trust me”, “She’ll be right mate”, “This is best for you” and a host of other easy to learn one-liners. 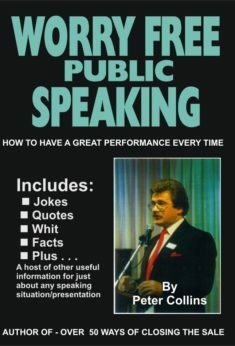 To achieve results, their presentation has been rewritten to include phrases that exaggerate, overstate and manipulate. And rather than advise, they impress. In time they harden their attitude towards their prospects, their peers and their companies. But the irony is – people who promise great things to get the sale, fail more often than those who bungle their way through a bad call. The reason I have written this book, I’m in my sixties, I’ve gained a lot from sales and now feel it’s the right time to give back what I can to a profession that has given me so much; introduced me to so many wonderful people; gave me a chance to learn from some of the “real” sales masters in Australia and from around the world. 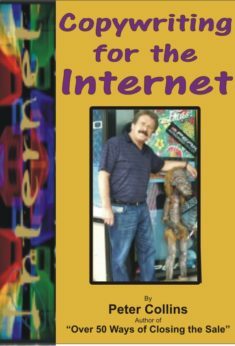 So take this book as my gratitude for the 44 great years the selling industry has given me. I’ll probably be riddled for writing this book, by those that have achieved very little in sales and disagree with what’s written here, for no other reason than they have never seen or heard it before. But the truth is, the contents of this book will be dynamite in the hands of the true professionals, because it will remind them of how to fine tune certain things to get them on track. It will also move so many others to a new level in sales, giving them a new status and higher income. Yet I know others will dismiss it outright. I have not written this book to win a popularity contest, but to pass on the things that have allowed me “Hall of Fame” status in two multinationals, and to break hundreds of National and International Sales Records and Awards over the years, then to be a distant Mentor to others as I have had the privilege to have been mentored by so many of the Greats as I’ve described in the editorial at the beginning of Part 3 of this book, and reproduced it here in its entirety. “I have been in sales now for near on 51 years. I can personally tell you of the countless rewards that the industry has blessed me with, the wonderful places I have been to, the luxuries I have enjoyed and the people I have been lucky enough to meet that have helped shape my life. Many will never know how much of an impact they’ve had on me or how they’ve influenced my lifestyle, my friendships and my focus. These are the ones I met reading their books, listening to them on reel to reel tape, audio cassette, CD and now mp3, watching them on 16mm film, video cassette, DVD and mp4, or attending their breakfasts, keynote talks and seminars. Some of them I have been lucky enough to have met in person and yet others I have been even luckier, I shared a stage with them as a trainer or a public speaker. There are also so many, many others that I’ve had the privilege of working with or managing over the years. All are my hero’s because of their influence on my life in one way or another. 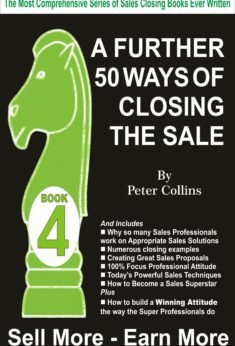 I quickly learned that modern salespeople, the ones that are being spoon-fed by their employers, who also provided them with books, CD’s, training and external seminars, were the same ones that were anxious to learn the latest selling concepts or the newest closing techniques, so they could turn (what was already an easy work life-style) into an easier work life-style. Guess what. That oasis didn’t exist around 25 or 30 years ago, and it definitely doesn’t exist today. What today’s modern average seller is yet to understand, is that the ability to close is not a survival issue. Having the ability and knowledge necessary to ensure that a sale is made is the only issue worth considering. But they go off on tangents on the mistaken belief that their employers do not want to pay salespeople for sales calls that end in “No” or “Maybe”. And that’s why they believe that there is a simple way to get a “Yes” on every call. But that couldn’t be farther from the truth. Whether we believe this or not, every one of us gives off certain vibes that can make a prospect feel good in our presence, and at other times feel really uncomfortable. Discomfort, in turn, can create doubt and doubtful and uncomfortable prospects tend not to buy. The same doubt can be just as apparent when we leave a voice mail as it is when we sit down in front of a potential customer. Women are usually better at sensing this than men are, but men also sense things just as quickly if they are constantly observing, evaluating and analysing the performance of others . . . and that’s what most managers do. So let’s talk about desperation in salespeople. No matter what level of desperation the salesperson is suffering, it’s still desperation and desperation creates other on-going issues and problems, that if not addressed can have dire consequences both for the salesperson and employer alike. So let’s investigate this further. 1) If someone has “lost hope” they have generally lost the will to do most things. In this instance that could mean they have lost the will to anything. They may just go into remote control mode and stay there. Now, that’s a worry. 2) I they are suffering “extreme need” then they could be capable of resorting to a variety of extreme measures to keep their figures up. That could mean a compromise of ethics and integrity. In so many cases I have experienced desperate getting the sale at any cost. 3) If “anxiety” is allowed to take a grip any number of “downward spiral type issues could follow. Depression is one that can cause one to camouflage their anxiety making it hard for the average manager to spot. Each of the three above is at the extreme, but it is well worth noting them all at this point. If the purpose of business is getting and keeping customers, then the purpose of a salesperson is to develop a customer who will buy more than once and whose experience will be so positive that they will give the salesperson additional referral business too. Salespeople who have lost hope or are anxious are the ones who perform differently than self-confident, hopeful salespeople. Desperate salespeople also have a different mindset, their purpose for making calls takes on a new purpose, and that purpose is to make a sale at any cost in order to keep their job for another month. 5.1 – DO YOU PRESENTLY USE THE “SMART” PLAN?